Stand Up and be counted November 17-21 at the State House. Sustainable Belmont and Belmont Mothers Out Front invite you to Stand Up for clean energy at a five day standout at the State House. 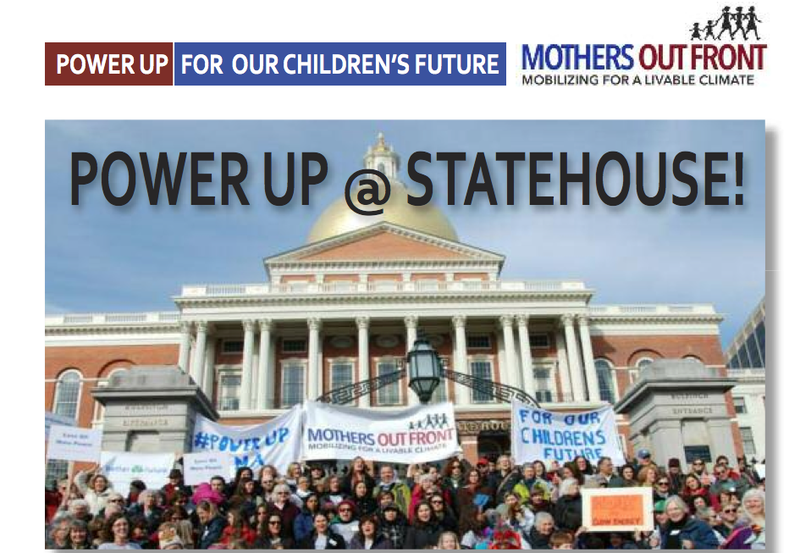 Mothers Out Front and its allies, including 350MA, Better Futures Project, Clean Water Action, and others, will hold a Power Up standout from noon to 1 pm on November 17-21. Join Belmont and Cambridge supporters to highlight climate change related flooding threats on Wednesday, November 19th, or join in the final rally on Friday, November 21st. Or come to both! RSVP at MothersOutFront.org, or contact Sustainable Belmont member Jenny Marusiak at jmarusiak@gmail.com if you’d like to join a group. No preparation is required: Just show up! If you are unable to attend but still want your voice to count, let Mothers Out Front know you’ll be calling Governor Patrick at 617-725-4005 on Friday, November 21st to ask him to leave a strong clean energy legacy by committing to having all new energy needs in Massachusetts come from clean renewable resources. Massachusetts has some tough energy decisions to make in the days ahead. Let’s make sure those decisions are in the best interest of our children.